In signing with ArteQuesta, Koren stated, "I'm very excited and looking forward to a fruitful collaboration. Through my photography, I'd rather be honest than impressive." MILL VALLEY, Calif., Dec. 2, 2015 (SEND2PRESS NEWSWIRE) — Fine Art Investment firm ArteQuesta announces the exclusive USA representation of world-renowned Israeli Photo Journalist, Ziv Koren. “ArteQuesta works with varied artists and collections, but none who specialize in photography and photojournalism. Representing Ziv Koren allows us to offer his incredible, thought-provoking works to our clients and the art community globally,” says Rayah Levy, ArteQuesta’s Founder and CEO. Koren, a freelance photographer since 1992, is currently affiliated with Polaris Images and has been a Canon Ambassador since 2008. Perhaps best known for his award-winning 2003 project “Louai Mer’i, a sergeant, is going home,” documenting an injured solider, he recently unveiled an acclaimed “Writing with Light” exhibition at the Tel-Aviv Exhibition Grounds, which is now touring the far east. In 2000 one of Koren’s images was chosen by World Press Photo as one of the 200 Best Pictures from the Previous 45 Years. He’s won numerous awards including World Press Photo and Photo District News awards, Yann Geffroy Award, International Color Award and Picture of the Year. Koren has published 15 books and has covered the Israeli-Arab conflict, Tsunamis, the Haiti earthquake, Nepal earthquake, Guantanamo Prison, and AIDS in South Africa, among other critical moments in history. His photographs have been published in Time, Newsweek, and Wired, among many others. Koren’s photographs have been included in numerous exhibitions worldwide including the Metropolitan Museum of Tokyo, Memorial Museum in Spain, War Museum in Croatia, National Museum of Arts in Rome, and The Israel Museum. Koren also lectures around the world. * Photo Caption: Jerusalem, Israel, Aug. 2004, by Ziv Koren. 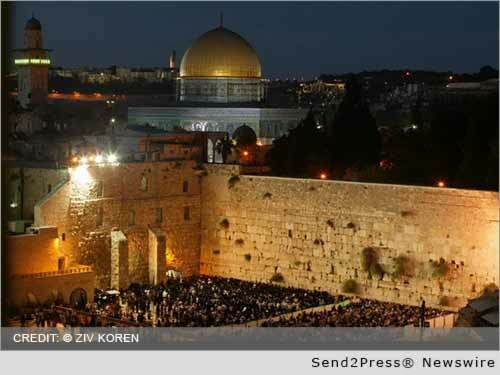 The Western Wall and the golden Dome on the Temple Mount, at the old city of Jerusalem. Original Keywords: Rayah Levy ArteQuesta Mill Valley California MILL VALLEY, Calif.
REFERENCES: California Business News, Rayah Levy ArteQuesta Mill Valley California MILL VALLEY, Calif.